Australia's plastic rubbish has made its way into every ocean in the world. New research shows that it doesn't matter where in the world plastic rubbish enters the ocean, it can end up in any of the five ocean basins. The research also showed that, globally, humans have put so much plastic into our planet's oceans that even if everyone in the world stopped putting rubbish in the ocean today, giant rubbish patches would continue to grow for hundreds of years. These were just two startling results from an investigation by researchers at the Australian Research Council Centre of Excellence for Climate System Science, based at UNSW, that looked at how these giant ocean garbage patches, some the size of NSW, form as a result of ocean currents. "There are five known garbage patches in the subtropical oceans between each of the continents. Each contains so much plastic that if you were to drag a net through these areas you would pull up more plastic than biomass," said lead author Erik Van Sebille, who is a Research Fellow at the Centre. "Interestingly, our research suggests a smaller sixth garbage patch may form within the Arctic Circle in the Barents Sea, although we don't expect that to appear for another 50 years." Another result showed, for the first time, that giant oceanic eddies, some up to 50km across, actually helped shift plastics between garbage patches that were thousands of miles apart and in entirely different oceans. If you were to drop a rubber ducky in the ocean, or 28,800 floating toys as happened in 1992, it could end up in any ocean in the world according to this research. "This means that garbage from any country can end up in any one of these garbage patches. This tells us that no single country is responsible. Ocean garbage is an international problem that requires an international solution," said Dr Van Sebille. To achieve their results, the researchers used data from drifter buoys, which are part of the Global Drifter Program, to determine the movement of surface ocean currents. The program releases hundreds of drifter buoys into the ocean every year. Each buoy floats around the ocean sending out regular 140 character messages on its location and the ocean conditions it's experiencing. Dr Van Sebille describes it as being like Twitter from the ocean. The data gathered by these buoys was then used to determine how garbage, and plastics in particular, moved around the ocean. The garbage eventually found its way to areas where ocean currents and winds converged, known as gyres. It was here that the massive garbage patches formed. "If you sail through these areas you will not see big lumps of plastics or rubber duckies or things like that. The sun and interaction with the ocean breaks the plastics down into very small pellets that are almost invisible to the naked eye." Dr Van Sebille said. 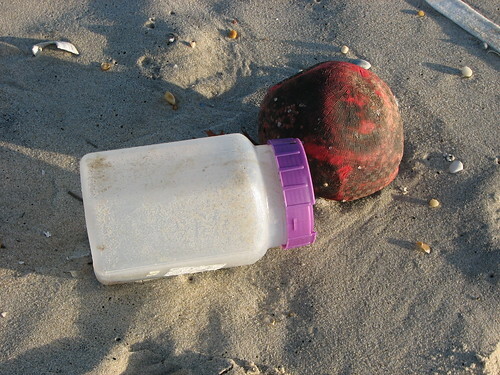 "However, these plastics even at this small size do affect ecosystems - fish and albatross swallow these plastics while phytoplankton can use the floating pellets to stay buoyant and float near the surface where they grow best. Plastic is also the canary in the coal mine: poisonous chemicals, that are much more hazardous to the ecology, ride the currents in the same way and are actually absorbed by the plastic pellets." In the next stage of his research, Dr Van Sebille wants to examine what happens to plastics closer to the coast. "Clearly, by the amount of plastic found on beaches not all of it ends up in the gyres to form garbage patches in the deep ocean. We need to find out what happens to the plastics closer to land, where most fishing occurs, and what effect that has on the environment around our coasts." Watch this video explaining the plastic problem.